Well, maybe. You should always inquire about the possibility of working remotely first. Sound redundant to you? Well, a surprising amount of employers these days are embracing remote workers as part of their workforce, so if your employer is one of them, you may not need to quit at all. Still, ensure that if you do arrange a remote working relationship, that it’s going to work with your travel plans. There’s nothing more anticlimactic than spending all of your “travel time” on a beautiful beach stuck behind your laptop. Always keep this in mind while you go through the process: Nothing is holding you back from the life you desire but your own thinking. That said, we recommend reading a few books by authors who are experts on the topic of quitting your job to travel and building a new life for yourself – The 4-Hour Workweek and The $100 Startup are our favourites. Once you’ve read those and realize the power you have within your own hands, ask yourself a few critical questions to make sure the move is right for you. Will you be happier traveling the world than you are at your current job? Will you be able to sustain yourself for a few months while you go through the transition period? Are you ready to live a life you love, rather than one you’re lukewarm about? If the answers to these questions are a resounding Yes, then you’re ready to take the leap. Go for it! Even just a few years ago, the list of jobs that could be done remotely was very small. But today, new jobs are being added to that list every day! Sites like Upwork and Fiverr make it extremely easy for you as a freelancer to offer your skills to paying clients, or if you’re an entrepreneur yourself, you can outsource the jobs you can’t do to people on these platforms just as easily. Everyone from graphic designers like Pete to video experts like Sean can offer their skills for hire on these sites, and a lot of travelers are paying their way around the world by doing exactly that. It’s also possible that you have a particularly special skill that others are willing to pay you for, and you can set up your own business doing that. That’s how traveling photographers like Gareth and Matt do things, and the same can be said for travel writers like Rachel and Jessica. And if you’re really passionate about what you do, you can set up a class of your own to teach others what you do as well, like what Daniel has built with DJB Photography School. The sky really is the limit when it comes to building your new income stream, so be confident and don’t become discouraged if the first few things you try don’t work out. You’ve done it! You’ve left the confines of your office behind for a remote work arrangement, or you’ve ditched the old job entirely and are now working on something you love. The only thing left is to buy your flight! A lot of travelers will tell you about the psychological benefits of booking a one-way ticket rather than a roundtrip, since it lends some permanency to your new lifestyle. And you know what? They’re totally right. Your new life is one of spontaneity, and that requires breaking out of the same old routines you’ve been living. Johnny will tell you how important booking a one-way ticket was for him when he first moved to Thailand, and Josh, whose been perpetually traveling around the world for several years now, would say the exact same thing. We recommend booking with Yore Oyster, a flight hacking startup that saves travelers 20-50% off on their international flights, since they’re particularly good at saving money on international one-way trips, and their clients rave about them. And the best part is: the destination isn’t even as important as the commitment to yourself to actually go for it. You’ve earned this life of travel, after all. And now you’re all set! 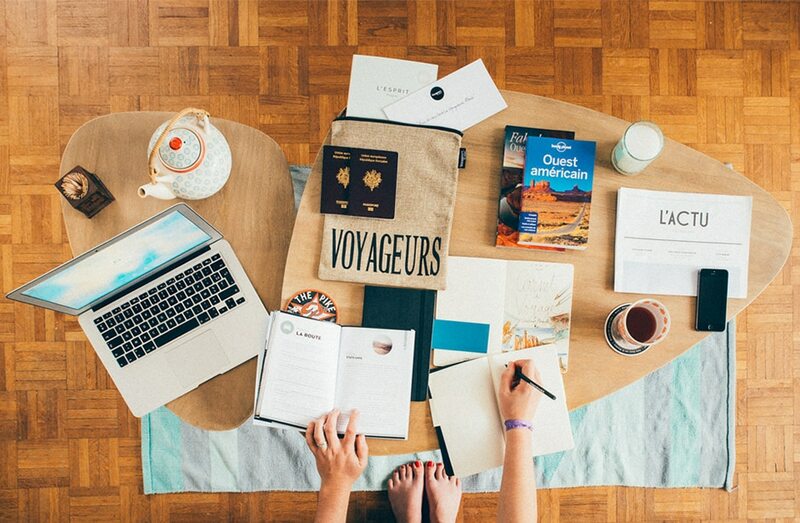 You’ve successfully quit your job and travel is now a staple in your life. How do you prepare to leave? Well, our Ultimate Guide to Packing for International Travel is a good starting point, since it covers both the high-level thinking behind how to pack, as well as specific packing lists of items you should and should not bring with you. Then, our roundup of the 9 Best Travel Tools of 2016 is another valuable in-depth resource, which will show you not only how to use travel websites and apps to enhance your travel experience, but how you can actually make money while you travel using the things you already own. Take a look at the #4-5-6 combination there to see what we mean and apply it for yourself. And that will get you started! If you have questions about making the jump from location-dependent employee to a globetrotting adventurer, post it on our Facebook page or ask us on Twitter, we’d LOVE to hear from you. There are thousands upon thousands of example of people in your shoes who have successfully quit their job to travel the world – all that sets them apart from you is that they followed their gut and actually went for it. Give yourself a chance to create a life you love and you’ll be amazed at how easily it becomes a reality.